Many electronic devices require periodic maintenance to remove files that are generated in the system. This problem is particularly affect computers but now smartphones are like small computers and are not immune to this problem. Continued use causes the appearance of a large number of unnecessary files that are stored in the memory of your smartphone and obviously take up space. When a device, be it a computer or a smartphone, run out of space, we run the risk that other problems but mostly we notice that the system is very slow and any normal task costs much more. Therefore it is very important to remove all the data we do not need and keep the memory with enough free space to make the system work smoothly. The downside of these unnecessary files, or “Junk Data”, as they are known in the jargon of the computer world, is that we can not see them in the memory of our phones and deleting them is not always easy. 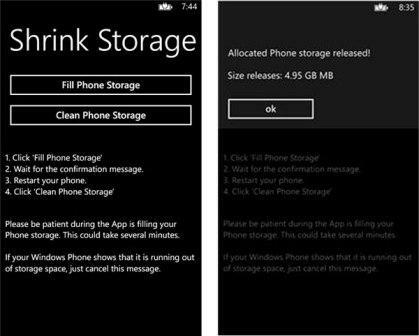 The Nokia Lumia with Windows Phone 8 can perform this action easily using the free application Shrink Storage. A curious detail about the unnecessary private archives of the Nokia Lumia is that can not be erased unless the memory is completely full. When we got to limit a message that invites us to clear the memory but until then there is no option to clear those. What makes Shrink Storage is pretending that the memory has been filled out completely in order to carry out the cleaning process in the terminal. As mentioned, the application is free and available for all Nokia Lumia with Windows Phone 8. After installing you have to follow the steps that check to clear the data. First you have to press Fill Phone Storage to simulate the memory is full, and then delete the excess power, so to speak. When you finish filling a confirmation message appears, until then we must wait for it to complete. Then restart the phone for the process to work properly, turn off the phone and on. Again launch the application and then click on Clean Phone Storage, at this point it begin to eliminate unnecessary information, the process can take several minutes so be patient and do not touch anything until the end. When finished you see a notice where it appears the approximate amount of data removed in the process, it may happen that delete a large amount (e.g. Gb) or it may be that there is no excess data. Developer recommended to repeat the process several times as it is possible that the first does not detect all unnecessary information so we made sure that we removed all and there is nothing that can interfere with the proper functioning of our Nokia Lumia.